Who are the Election Night Gatekeepers? Who are the Election Night Gatekeepers? Which 13 12 groups control Election Night “results”? ElectionNightGatekeepers.com was erected to help ensure an honest vote count for all candidates and all voters in every election. But we must put the background evidence you are about to see — probably for the first time – in context in relation to what’s happening RIGHT NOW in the Real World. Spoiler alert: the 5 Big TV Networks (ABC, CBS, NBC, CNN, FOX) and related big media are all owned by those who have wrested the power to issue the world’s money. For short hand, we might call this the “Goldman-Sachs/Federal Reserve” crowd. This power behind the Big Media Cabal ALSO OWNS THE 3 COMPANIES that “counts” 95% of the USA vote on secret computer programs, – software that is totally off limits to election officials and everyone else, because of contracts our election officials in each county sign with one of these 3 mega-Election Vendor corporations, or their smaller front companies. Incredible, but true. So these three companies, ES &S, Hart, & Dominion (which recently bought Diebold in 2013) have ABSOLUTE power to fix the election computers to elect Trump or Hillary — or even Johnson or Stein — but what they do MUST BE BELIEVABLE. This Election Votescam Syndicate, these Election Night Gatekeepers, have consolidated this power over our election system since at least as far back as 1988, “coincidentally” the era of the Bushes and Clintons, the two families most prominently fronting for the “Goldman-Sachs/Federal Reserve” Crowd. That’s why we are urging Mr. Trump to follow the advice in the video, “40 Seconds to Victory for Trump”, and add about 40 seconds to his remaining campaign rallies, speeches, and interviews that: 1) he’s worried about the November Election beingCOMPUTER-RIGGED against him; 2) telling people to watch the HBO documentary, “Hacking Democracy”; and 3) telling people to come here to ElectionNightGatekeepers.com, where they can get the entire hidden story of how a powerful cabal has literally stolen our election system — taken the election system totally out of the hands of the American voters, who now serve as window-dressing for their illegal elections (See “Supreme Court Decisions” menu tab). Only Donald Trump can make this a burning issue in the national mind. IF MR. TRUMP DOES NOT DO TAKE THIS ADVICE, OR SOMETHING AS EFFECTIVE AS THIS ADVICE in “40 Seconds to Victory for Trump”, then he will surely “lose” by computer fraud, and we are going to see “President Hillary” for sure, installed by computer-election fraud by the Election Night Gatekeepers. IF the 5 Big TV Networks and their co-conspirators, the above mentioned 3 mega-election vendors, feel that the whole country is aware of how they can computer-rig the 2016 Presidential Election, then they might not dare to computer-steal it. In this matter, Mr. Trump will probably have to overrule ALL of his weak-kneed advisers — those who want to be in good-standing with the 5 Big TV networks and the New York-Washington Ruling Elite if Trump loses. The ONLY “argument” that the Big Media puts forth for Hillary is “she’s winning in our polls, she’s winning in our polls!” — But, what goes unsaid and unrealized by the vast majority, — is that the public is taking these polls on blind faith, BLIND FAITH. No one knows how these polls are done, except the handful of people doing them. These are “black box” polls which most people are irresponsibly accepting as infallibly predicting the election outcome. Thus, the whole future of the nation and the world is being determined by “black box” public opinion polls, “black box” exit polls, and “black box” easily-rigged computer “counts” on election night — all controlled by the 5 Big TV Networks and the other 7 entities which constitute the Election Night Gatekeepers. No one knows if the viciously crooked Big TV Networks’ anointed pollsters pay people to make the calls, but then just falsify the published results. Who is called? Who answers the phone? Who knows? And yet, these published poll results are treated as if Angels from Heaven brought them down to us. No one with a big microphone challenges the constant assertion that these Big Media polls are “scientific” — polls which often sample as few as 800, 500, or even 200 people. These tiny samplings are more scientific than 1 million people rushing to their computer to vote after a Presidential Debate (on online polling systems that permit each person to vote only once per IP address)? At that moment, Karl Rove actually objected to the projections in real time on the Megyn Kelly show on FOX News — and Megyn Kelly left the anchor desk to go find the statisticians on live camera — a first in US Election history. So, was computerized votefraud used against Romney in 2012? Probably. In other words, it always comes down to this: the evil info-wizards at the Big Media are telling the American people: “Don’t believe your “lying eyes”, believe what we tell you, dummies.” And, except in 5 counties in New Hampshire and maybe a few other small places, the one non-negotiable rule of the Republican and Democratic election officials has been: the companies we hire must be allowed to process the vote in secret, behind police guard, — and you Americans absolutely can not check or count the ballots before we take them out of your sight. In other words, since 1988, we Americans have allowed ourselves to be treated like Communist slaves and/or subjects of a tin-horn dictatorship. Thomas Jefferson and Patrick Henry must be spinning in their graves. Shame on us! These public opinion polls amount to weapon-ized, “black box”, falsified polls by the news & election divisions of the 5 TV Networks, the greatest liars and deceivers on earth, — truly the greatest enemies of America and mankind. These polls are meant to manipulate and form public opinion, not reflect it. As never before, thanks to the pervasiveness of Big Media in the hands of a few, people are being maneuvered in dangerous directions without being aware that they are being so maneuvered. These “public opinion polls” constitute psychological warfare by the malicious Big Media, following the evil and manipulative techniques of propaganda-thug Edward Bernays (nephew of Sigmund Freud), and the sinister Tavistock Institute. Americans have been kept in the dark about the Election Night Gatekeepers by the 5 Big TV Networks, precisely because these networks are neck-deep in PROTECTING the computerized election fraud system which is in place. The Big Networks control what public opinion polls get publicized in the months leading up to the election. They totally control the “results” of the exit polls on election day through a company which they jointly own, National Election Pool. And they shield from public view the 3 Mega-corporations (which have been hired by 99% of our counties) which own the secret software which tells the election computers what to do on election night. When there has arisen a Presidential candidate who threatens to derail or reverse key points of the Ruling Elite agenda – like Trump, Ron Paul, or Patrick Buchanan (in the 1990s) — the 5 Big TV networks and those behind them issue fraudulent public opinion polls to manipulate the population. They can only issue these phony polls with confidence because they know that their 3 co-conspirators (ES &S, Hart, Dominion – which own the secret computer programs that count 96% of the USA vote on election night) — can make their phony public opinion polls “come true” on election night by computer votescam. Elections have been taken out of the hands of the American people by an alliance of 12 tricky and seditious Election Night Gatekeepers, agents of the coalition of money interests behind them. The purpose of this article is to explain how this happened, how we can maybe stop them from falsifying the election results to install Hillary Clinton as President in 2016, and how we can reverse the situation and restore transparent, honest elections. The fact is that only 3 mega-election vendors have the power to install Trump or Hillary Clinton into the Presidency in the 2016 Presidential election. And the 5 Big TV Networks enable these three privately owned corporations (ES &S, Hart, Dominion) to have this power by hiding their very existence from the American people, as well as their KEY and DOMINATING role on Election Night. Have you ever heard of ES &S, Hart, or Dominion? Probably not. These three mega-corporations could make the election computers say that Trump “won” 99% to 1%, or they could make the election computers say that Hillary Clinton “won” 99% to 1% – or anything in between. But what they and the other Election Night Gatekeepers announce MUST be believable, so that the American people accept the results, whether true — or whether grotesquely falsified by the Election Night Gatekeepers. “Making the computer-generated election night results believable” is the purpose of the endless, mysteriously-done “black box” public opinion polls treated so reverently by the 5 Big TV Networks in the months and weeks leading up to election day. And it is also the purpose of the mysteriously-done exit polls taken on election day by another one of the Election Night Gatekeepers (National Election Pool, owned by the 5 big TV networks and AP wire). For starters, since at least as far back as 1988, a handful of private corporations have totally controlled the “count” of 96% of the ballots in the USA for the November elections. Election officials in 98%+ of our counties have effectively stepped aside and turned over our elections to one of these few mega-election vendors. By now, in 2016, only three computerized Election Vendor companies have total control over the published election night “results” as explained above. These private companies, again, are ES &S, Hart Intercivic, and Dominion (which bought Diebold and Sequoia circa 2013). These companies “count” the votes on secret software programs — programs easily rigged by these same companies, which, of course, own the software. The 5 Big TV Networks (ABC, CBS, NBC, CNN, FOX) and related big media protect these three mega-Election Vendors (ES & S, Hart, Dominion) by never (or almost never) mentioning them. 99% of the American people have never even heard of ES &S, Hart Civic, or Dominion. The American people certainly don’t know the key and absolutely dominating role that these 3 mega-Election Vendors play on election night. And the Big TV Networks NEVER do investigations into these three mega-companies, never ask how it is possible that 98%+ of our 3141 counties in the USA have hired them, never ask the county election officials or Secretaries of State why these election officials have signed a contract forbidding them to look at the software of the 3 big Election Vendors, never question in any way this unholy concentration of power in the hands of so few on election night, and never invite the American people to think about these disturbing election night realities. What Happens On Election Night in the USA? On November 2[nd 2004] millions of Americans will cast their votes for President in computerized voting systems that can be rigged by corporate . . . insiders. . . . The potential for fraud and error is daunting. About 61 million of the votes in November, more than half the total, will be counted in the computers of one company, the privately held Election Systems and Software (ES&S) of Omaha, Nebraska. Altogether, nearly 100 million votes will be counted in computers provided and programmed by ES&S and three other private corporations: British-owned Sequoia Voting Systems of Oakland, California, whose touch-screen voting equipment was rejected as insecure against fraud by New York City in the 1990s; . . . Diebold Election Systems of McKinney, Texas, whose machines malfunctioned this year in a California election; and Hart InterCivic of Austin . . . In 2004, one of the officers of Diebold said in public that Diebold was going to make sure that W. Bush got re-elected. Ever since then, Diebold had become the symbol of election rigging. So — DAMAGE CONTROL! Circa 2013, a company called Dominion bought Diebold and Sequoia. So that’s why we have the number “13” crossed out in the earlier part of this article, as now there are only 12 Election Night gatekeepers. We also have the number “4” crossed out, as now only 3 mega-corporations count about 96% of the US vote. A word about the musical chairs played by these super powerful mega-corporations, which never change their stripes, their secrecy, or their mode of operation. They only change their names and locations. As an example, CES (Computer Election Services) was based in California in the 70s and early 80s. Then CES morphed into BRC (Business Records Corporation) based in Texas for the 80s and part of the 90s. BRC then became ES & S around the turn of the century. Another example of musical chairs involves how another of the Election Night Gatekeepers, Voter News Service (owned by the 5 Big TV Networks and AP wire) morphed into National Election Pool after 2004, which will be further explained below. PLEASE NOTE, as stated above: These 3 mega-corporations do NOT break into the system. One of these companies, or one of their more recently appearing smaller front companies, are hired by each county. There are 3200+ counties in the USA. Starting circa 1973 and culminating by 1988, 99% of these counties made the decision to hire one of these companies. For instance, Hamilton County (Cincinnati), Ohio uses Hart Civic. Butler County, Ohio (the largest county in former Speaker of the House John Boehner’s former district) hires ES & S. And all of South Carolina hires ES & S.
The RNC and the DNC are obviously controlled by the same background financial forces (the Goldman-Sachs/Federal Reserve Board crowd, for shorthand) which own the billion dollar Election Vendor companies, ES &S, Hart Civic, and Dominion. The RNC and the DNC both recommend to all of their 50 Secretaries of State in all 50 states to approve these three mega-companies for vote processing. Each county in each state is then strongly encouraged to hire one these three companies, to contract with them to process the county elections. The late Collier Brothers (authors of “Votescam: The Stealing of America”, 1993) felt that massive bribes have changed hands, especially in the 1970s and 1980s, to induce counties which were resisting the Big Computerized Election Vendors – to hire them. The county Boards of Elections are told that any one of these three companies will process the elections professionally and virtually trouble free. The local Board of Election officials in each county then step aside and hand everything essential over to one of these three companies. After the November election night, election officials sign “results” when they have no idea if the results are true or false. Incredibly, as stated above, all the counties sign a contract that the Election officials are NOT allowed to look at the source code of the privately-owned election software that tells the computers what to do on election night. So who are the final Seven Election night gatekeepers? — 12. NEP (National Election Pool) formerly VNS (Voter News Service) from 1964 to 2004 – same people, same company, same function. 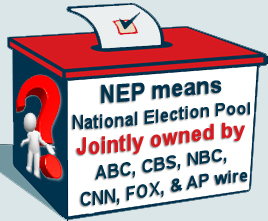 NEP (National Election Pool), believe or not, is owned jointly by ABC, CBS, NBC, CNN, FOX and AP wire. (!!!!!!) Are Americans aware of this? Of course not! The five Big TV networks hide it from us! On election night, all announcements of election “results” are relayed to the public by the 5 Big TV Networks and AP after they get the word from NEP, their jointly owned private company. NEP collects the results in one way or another from the computerized machines in each county, including direct access to the mainframe election computers in some counties, and then passes it on to their owners. All big media websites on the national and gubernatorial election announcements are controlled by NEP. When NEP changes something, it changes on all Big Media websites simultaneously. IMPORTANT: ANY COMPETITION between the 5 Big TV networks on projecting winners and losers is a total fake, and the network election divisions know it’s a fake – a deliberate deception on the part of the 5 Big TV Networks. The Five Big TV Networks and AP get the exact same information, at the exact same time, from the exact same source, i.e., the company they jointly own, i.e., NEP (National Election Pool). The announced Exit Polls are conducted under the supervision of NEP, and then the results are passed on to the 5 Big TV Networks simultaneously. And yet the Big TV Networks have maintained this “we’re projecting the winner first” deception since the dawn of the computerized election age circa 1973. They take turns being “first” to call the “winner” and “losers” in various states. The purpose of the highly questionable VNS/NEP/ABC/CBS/NBC/CNN/FOX exit polls (debunked completely, in my opinion, in two chapters in “Votescam: The Stealing of America” by the late Collier Brothers) is to prepare the TV viewer for the unverifiable, easily-rigged computer “count” which is announced a few hours later, or even a few minutes later on election night. We caught up with two exit polls over the years — as they are very, very hard to find. Why? Because there are very few of them. How does very, very few exit polls in a nation of 200,000 or so precincts provide any kind of a scientific basis to project winners and losers in close Congressional, Senatorial, and Presidential races? By the way, you have to find these exit polls hit and miss, because the networks will not publish in advance where they are going to be conducted. Like everything else they do, our would-be Rulers like to operate in secrecy, — total secrecy if possible. One exit poll we caught up with was being conducted during the 1996 New Hampshire Presidential Primary on February 20, 1996 at a school in Manchester. The lady hired by VNS (Voter News Service, predecessor of today’s NEP) told us that they arrive about 9 AM, missing the morning rush from 7 AM to 9 AM. Then, only about one out of 15 people will talk to them. Why? Some people don’t want to talk about their vote. And many people are in a hurry. They have to be somewhere, pick up their mother for a doctor’s appointment, have to get to work, etc. etc. etc. AND, the VNS exit pollers call in their results to VNS in New York City at about 5 PM — meaning that they miss the evening rush hour from 5 PM to 7 PM. We filmed the VNS lady calling in her results on a pay phone in the school lobby while HUNDREDS of people were walking past her on their way to vote in the school gym. Missing the morning rush? Missing the evening rush? Only 1 out of 15 people willing to talk to them? Where is the scientific basis of these exit polls??? By the way, here is a picture of the Voter News Service box in which the NH exit poll lady put her filled-out exit polling forms, in case there is any doubt about who owned Voter News Service then. Click here for the picture of that box.— And the owners of the successor to VNS (Voter News Service), NEP (News Election Pool), are revealed on Wikipedia, among other places.Click here for the owners of National Election Pool. The second exit poll we caught up with was in Boone County, Kentucky in 1996 on the day of the November Presidential election. Someone called my office about 3 PM in the afternoon and I rushed over to the location as fast as I could after finishing up what I had to do. With rush hour traffic, I got their about 5:20 PM with a 7:30 PM poll closing. True to what the VNS exit poll lady in New Hampshire had told us, the exit pollers had already left. Again, there were HUNDREDS of people in line waiting to vote. How does missing the rush hour periods of the election day — with only 1 out of 15 voters willing to talk to the exit pollers in the intervening hours of 9 AM to 5 PM — provide any kind of a scientific basis to project winners and losers, especially in close races? Which brings us to one of the most absurd “projections” in the computerized election era: the 5 TV networks “projecting” Al Gore to “win” Florida at about 9:45 PM EST on November election night in year 2000, during the infamous Bush-Gore contest. It turned out that there were only 39 exit polls being conducted by the Voter News Service for their owners, the 5 Big TV Networks, throughout all of Florida that election night. 39 exit polls in a state of 7000 voting precincts! Now keep in mind that the election was allegedly so close it wasn’t decided (?) until 35 days after election day. And yet, on the basis of these 39 magic exit polls, all the 5 Big TV Networks projected Gore as the winner in Florida about 10 PM EST, which would have given the election to Gore. A little later, W. Bush came on TV in one of the Bush homes in Texas to state that (paraphrase), “My brother said that wasn’t right.” Now what W’s brother, Governor Jeb Bush of Florida, had to do with the election count, is still unclear. And at about 2 AM EST, all the Networks reversed themselves and said it was too close to call. Again, how could 39 exit polls out of 7000 voting precincts project a winner or loser in such a hairline close election? Some mind games were being played on the American people, but that’s another story for another article. And the story of Senator Bob Smith’s re-election in New Hampshire in 1996, in a way, says it all. Senator Bob Smith talking about how all the TV networks called him the loser in 1996 in the New Hampshire Senate race — only to be proven wrong when the hand counted ballots came in. “They forgot that in New Hampshire we count the votes before we declare the winner,” Smith later told a C-Span interviewer with a smile. That’s right. In 1996 there were 33 races for US Senate in 33 states. At that time, FOX news was only months old, so they were not yet involved as an owner of VNS (Voter News Service). But based on VNS exit polls, the other four networks, — ABC, CBS, NBC, and CNN — “projected” the correct winner in 32 of the 33 states, i.e., in the states that were “counted” on the secret, easily-rigged computerized elections. In the 33rd state, in New Hampshire, in the one state where 1/2 of the votes (at that time in 1996) were counted by hand immediately as the polls closed, ALL FOUR NETWORKS GOT IT WRONG. All four networks projected the Democrat, Richard Swett, as the “winner.” But as the votes trickled in from the hand-counted sections of the state, the Pro-Constitution Senator Bob Smith pulled ahead and WON the race. Smith said is was like going to Hell and then told you were really going to Heaven. What obvious lessons should one draw from this Senator Bob Smith-New Hampshire 1996 episode? — a) It strongly indicates what is the reality: that all of the Big TV Networks were getting their numbers from one source (VNS), and always projected the “winner” in lockstep. — b) That when the state was “counted” 100% by the secret, easily-rigged computer programs, then the computerized election process could always make the projections “come true.” BUT when one of the states was counted largely by immediate hand-counts at the neighborhood precincts, all the Big TV Networks could NOT project the winner, because the computers could not make the projection come true. My take: the computers used in Manchester and other large cities in New Hampshire in 1996 were programmed against the patriotic, constitution-minded Senator Smith. But the Votescam syndicate miscalculated, and did not steal enough votes from Senator Smith in the large cities using the election computers. And the hand-counted votes from the outlying areas of New Hampshire overtook the computerized warping of the vote in the large cities. a) ES &S, Diebold, Hart and Sequoia had long ago been hired by the brain-dead and/or traitorous county Boards of Election in all those states. (The primary states which were participants in Super Tuesday 2012 were: Georgia, Ohio, Massachusetts, Vermont, Virginia, Tennessee, and Oklahoma.) These Boards of Elections had signed contracts which stated that they were not allowed to inspect in anyway the source code of the software which told the computers what to do on election night. b) In those states, citizens, candidates, and local press people were illegally prevented from getting at the ballots in any effective way to conduct a count of anytime. In some states, like Ohio, the citizens are prevented from even seeing any of the ballots after they put their own into the ATM-like machine at their polling place. In other states, like South Dakota, the citizens are allowed to watch the votes fed into scanner machines from a few feet away, which is as good as being 4 planets away, because no one can see what’s going on inside the computers in the scanners. d) Then NEP passes on the “results” to the 5 Big TV Networks and AP wire. e) Then the 5 Big TV networks and AP wire announce these results to the public, and the big Radio stations and Big Newspaper Dailies parrot these results to the public. “Why am I always being asked to prove these systems aren’t secure? The burden of proof ought to be on the vendor. You ask about the hardware. ‘Secret.’ The software? ‘Secret.’ What’s the cryptography? ‘Can’t tell you because that’ll compromise the secrecy of the machines.’… Federal testing procedures? ‘Secret’! Results of the tests? ‘Secret’! Basically we are required to have blind faith.” —Dr. David L. Dill, Professor, Computer Science, Stanford University, as cited by Ronnie Dugger in his article, “How They Could Steal the Election This Time”, which appeared in the August 16, 2004 edition of The Nation magazine. In 2012, reporters repeatedly said that it was hard to find anyone whose first choice was Romney. But yet he won handily in the computer “counted” primary states. When crunch time comes in an election season, the 5 Big TV Networks publish phony polls to push the public in the desired direction. The phony polls are confirmed by the phony exit polls, both of which are made to “come true” by the secret, easily-rigged election computers. i) You don’t have to be a computer expert, or understand computers at all, to grasp what is happening here. When someone — anyone — wants to count your votes in secret, you’ve got a problem. An the combination of the RNC, the DNC, ES &S, Hart, Dominion, ABC, CBS, NBC, CNN, FOX, AP wire, and NEP (National Election Pool) have succeeded in setting up a system where they DO “count” our votes in secret. And to add insult to injury: the 5 Big TV Networks and AP wire hide what is happening in US elections from the public. j) Victoria Collier, daughter of the late “Votescam” author Jim Collier, has said, “You can’t vote the bums out, because you didn’t vote the bums in.” That’s the point. Since 1973, the Votescam Syndicate have quietly imposed a sinister election fraud system on the American people. Right now the people have no effective say in any national election if the Big TV Networks and their cohorts which to rig the election under a scenario which is “BELIEVABLE” to the vast majority of the American people. The American people are like a little three year old in a car seat with a steering wheel. At election time they are laughing and turning the little plastic steering wheel as the parent drives the car. The parent looks over and says, “Good boy, Johnny. You’re such a big boy driving this car.” The American people are told by the 5 Big TV networks: “You’re the freest people ever.” In fact, the parent is the only one driving the car. In this analogy, the Parent are the wirepullers behind international banks like the FED (Federal Reserve Board), Goldman-Sachs, the IMF (International Monetary Fund) and the Bank of Settlements, (Follow the Money), through their 5 Big TV networks and their 3 Mega-Election Vendor Corporations. The child in the car seat is you and me, the American public. This “Parent” has the motive to keep moving more and more money to the top 1%, and to grasp more power inching closer and closer to a world police-state government. This is not free enterprise. It is Vulture Capitalism, which ends up in the same place as Socialism and Communism, with all the unnecessary centralized planning and needless regimentation of mankind those two systems entail. While it’s a brain twister at first, the top Socialists and Communists have always been the Billionaire Banksters. They want Communism for you and me, but Billionaire Ruler status for themselves. Communism and Socialism are the masks these Banksters wear, among other masks, when they are in the process of subduing a society. Commune-ism. The Banksters want 99% of the people on a large commune, living like animals, owning nothing, and being in needless debt from birth till death, while these Banksters run the world. That’s what Commune-ism means. This is the MOTIVE for computerized votefraud, and it is virtually impossible for most people to believe that there are sociopathic millionaires and billionaires who want to subdue mankind and rule the world. For a responsible introduction to this subject, see “The Secret of Oz” and the “Money Masters” on YouTube and on CD by Bill Still. And see “The Creature from Jekyll Island” by G. Edward Griffin, and “The Secrets of the Federal Reserve” by Eustace Mullins. Can’t Citizens Double Check the Published Computerized “Results” ?? Well, one might ask, can’t the citizens look at the ballots on election day and double check the computer count? Answer: NO! Any citizen or candidate or local press person who tries to get at the ballots in computerized counties will be illegally arrested by the local police, who have been tricked into protecting the Election Night Gatekeepers instead of the people and the integrity of the election. Can’t the citizens set up a process in advance with the local Board of Elections to count the actual ballots on election day in the computerized areas? Answer: NO! Unless you live in the 5 counties in New Hampshire which still count the votes constitutionally (by hand-count, BEFORE the ballots leave the public sight), then you cannot. Call your local county Board of Elections, or your Secretary of State, and try it. Secret counts are the problem. Conducting secret counts are a criminal activity by the 3131 or so counties of the 3141 counties in the United States, and by ALL 50 Secretaries of States. The only reason the county Boards of Elections exist is to hold transparent, honest elections so that what the people vote in the neighborhood polling places is what the Boards of Elections publish at the end of election night. By allowing 3 mega-Election-Vendors to conduct elections on secret computer programs, the local election officials and the Secretaries of State are sinning by stepping aside and TOTALLY abdicating their constitutionally mandated responsibilities. They are signing results when they don’t know if the results are true or false. Subversive. Treasonous. Aiding and abetting a foreign enemy, namely, the international bank corporations around the FED and Goldman-Sachs, which constitute an enemy without boundaries – an enemy of the United States of America, and almost all other nations. Look at the quote from Dr. David Dill of Stanford University again. What is the proprietary nature these absurdly “top secret” computer programs – owned by ES &S, Hart, and Dominion – which process our elections? As Votescam author Jim Collier said, “What’s the proprietary information? In elections, it’s one for you, one or me, one for you, one for me. Where’s the need for secret software?” Answer: the PROPRIETARY PART is so that the Election Vendors hired by the Counties can fix the elections. Votefraud Investigator & IT experts John Brakey of Arizona and Richard Charnin of Florida have proven as far as can be done by math and algorithms, that such rigging took place in several regional “Secret software” elections. All computer and machines MUST GO. This admonition was given by the developer of the first PC (personal computer), Adam Osborne in “Running Wild” published in 1979. He said computers are great, but never for elections because no one can be sure what is happening in them. Can computers theoretically run accurate elections if everyone involved is honest? Of course. But when the future of the city, the county, the state, the nation, and the world is at stake — the motive to warp the election is too great. Can paper ballots be counted by hand accurately if they are taken out of the public sight first if everyone involved is honest? Of course. But when the future of the city, the county, the state, the nation, and the world is at stake — the motive to warp the election is too great. Ballots must be counted right at closing time, by neighborhood citizens, BEFORE the ballots leave the sight of the polling place judges and the local neighborhood people. Also, there are high tech printing machines that can manufacture hundreds and thousands and tens of thousands of ballots per hour, so that the original ballots can be replaced before the pre-selected precincts are brought out to the public for the hand recount. The documentary “Hacking Democracy” featuring Bev Harris spotlights this “were-the-ballots-switched?” problem near the end of documentary in the segment dealing with the recount in Cleveland, Ohio after the 2004 Bush/Kerry Presidential election. The answer is simple. Ban all computers and machines from the voting process. Have pre-selected neighborhood citizens, selected by an open and fair process, count the paper ballots at each neighborhood polling place in public, right after the polls close, BEFORE the ballots leave the sight of the election judges or the public. Everyone is allowed to watch the count at close range as long as they don’t interfere with the count. The results are posted on the wall of the polling place for three days after the election for all to come and check. And each candidate should double check the county Board of Elections to make sure that they added up the numbers from all the local precincts correctly. (See the “More Information” menu tab at ElectionNightGatekeepers.com for exact legislation to restore transparent, honest elections. While the Old Guard Establishment will scream that restoring transparent, honest elections by hand count is impossible, it certainly is easily possible. It would take about 12 citizens on average at each polling place nationwide to do the counting. These counters used to be called scrutineers. And each of these scrutineers should be paid $100 each for about four hours work on election night. That would cost about $480 million per year for the primary, and $480 million per year for the general election. We spent $4 billion dollars per month in the first twelve months we were in Iraq in 2003-2004. That’s $48 billion dollars. That same $48 billion dollars would allow us to hand-count all elections for the primary and general election in November — for about 60 years. The Constitution requires elected officials to defend the United States against enemies, both foreign and domestic. The longer we have computerized elections — the more domestic enemies we have occupying offices. TO REPEAT: While computers are great for many things (I’m using one now! ), they are horrible and unacceptable for elections, because no one can see what’s happening inside a computer. The man who (I’m told) invented some version of the first home computer, Adam Osborne, wrote a book circa 1979 entitled, “Running Wild”. In that book, Osborne stated computers should never be used to count elections. So, whatever it takes, whatever the costs, we must restore transparent, honest hand-counted elections to every polling place in the United States of America. The hand-count must be conducted in each neighborhood polling place right as the polling place closes and BEFORE the ballots leave the public sight. Millions of Americans have fought and bled, and so many have died, to try and ensure our right to determine our nation’s destiny at the ballot box. We dare not continue to let a group of power-hungry sociopaths spit on their sacrifice. The documentary Hacking Democracy by HBO, the free online article from Chronicles Magazine, A House Without Doors, the book, “Votescam: The Stealing of America” by Jim and Ken Collier, the book “Black Box Voting” by Bev Harris free online at BlackBoxVoting.org, the LandesReport by Lynn Landes, the articles linked on the right hand column of the home page of votefraud.org, and information at WatchTheVoteUSA.com and GuardiansForLiberty.com, as well as the info all over this website (OpenLetterToDonaldTrump.com) give avalanches of documentation on this issue and all its ramifications. Somewhat repetitive of the article on this page, but shorter. Two important videos are at the bottom of this page, on South Carolina and Super Tuesday, and on the way the Iowa Caucus has been warped. Please forgive the below still being on this page. We are keeping it on this page until we can check if there is anything we have forgotten to include in the article above. Some or much of it is repetitive of what’s above because we are still editing and double-checking… you are, of course, invited to read it if you wish. ALL Americans HAVE A RIGHT to a verifiable count in line with THREE, still standing Supreme Court decisions. One of those US Supreme Court decisions, Westbury v. Sanders, 1964, stated that all other rights, even the most basic, are illusory if the right to vote is undermined. The other two relevant US Supreme Court decisions, namely, US v Mosley (1915) and Reynolds v Sims (1964) say that our right to vote consists of two parts: a) the right to cast a ballot; b) the right to KNOW that our vote has been counted accurately. The 2nd part of our right to vote is being violated whenever there are easily-rigged, secret Computerized counts. In the Iowa Caucus, — the FAIREST SYSTEM IN THE NATION if the candidates and citizens watch the vote count at all 1650+ local caucus locations, and then compare it against the published count at the state level by the Iowa GOP HQ, and by the Iowa Democratic State HQ — then the right to vote of Iowans is PRESERVED and in line with these still-standing Supreme Court decisions. The Iowans cast a ballot, or raise their hand in some way, at their local Caucus, and then the participants SEE the ballots counted before their eyes, right away, before the ballots leave the public site. (The crookery in the Iowa Caucus has been accomplished by the GOP manipulators at the STATE LEVEL who simply switch the votes en masse because the voters at the local level, and the candidates are (ABSURDLY) not watching to see if the published results at the state level accurately reflect how the voters voted at the local level. The problem is NOT the good Iowans at the local level, it is the VOTESCAM CROOKS at the STATE LEVEL. But, at least in the Iowa Caucus there is a CHANCE to catch any votefraud, and that’s what WatchTheVote2016.com is all about. In New Hampshire, for instance, 80% of the voters who are “voting” on computerized systems do have the right to cast a ballot. So far, so good. But, after they cast their ballots, the ballots are whisked away for processing in the “behind closed doors” computer rooms, from which the public, candidates, and local press are barred by police guard. The “count” is announced later that night. To repeat: no candidate, citizen, or local press person is allowed to see any actual ballots on election day, or for weeks thereafter. So the voters and the nation are taking these election “results” in such computerized elections ON AN ACT OF BLIND FAITH on election night, with no evidence. In the other 20% of New Hampshire, the ballots are counted properly, in the open, before the ballots leave the public sight — as votes were counted from 1787 or so, until the early 1970s. Pre-selected citizens from each neighborhood count the votes in public, and right as the polls close, and BEFORE the ballots leave the sight of the election judges or the sight of the public. A man who has become a friend of Watch The Vote in recent years, Mr. Douglas Bersaw, supervised the counting of the votes in such a constitutional way in Richmond, New Hampshire, where he served as Election Supervisor until just a few years ago. It’s do-able. It would cost the nation about 800 dollars a year to hand count all primary and November elections throughout the USA, — a mere pittance in the national budget to ensure we get the leaders whom the voters actually elect. When the “count” is conducted in secret (within a computer) powered by secretly programmed software (with source code usually programmed by persons unknown to even the local election officials) – then the second part of our right to vote is being violated and nullified. These realities about computerized elections have been ruthlessly censored by the Big TV Networks who are NECK DEEP in the process, and as guilty as they can be over the last 40 years, — complete with faked “competitions” to call the winner first, when all TV networks have been getting the exact same information, at the exact same time, from the exact same organization National Election Pool, or NEP (formerly Voter News Service, or VNS) which ABC, CBS, NBC, CNN, and FOX jointly own — together with AP wire. Nevertheless, there have been intermittent exposures in national publications, such as in The New Yorker in 1988 (The Dangers of Computerized Elections by Ronnie Dugger), the Nation in 2004 (How They Could Steal the Election This Time, Ronnie Dugger), American Opinion in 1977 (How Elections Are Stolen, Dr. Susan L.M. Huck), Harper’s magazine in 2012 (How to Rig An Election by Victoria Collier), and an excellent 5 minute report on CBS Evening News with Dan Rather on November 7, 1988, in which Rather interviewed Dr. Howard Strauss of Princeton University and other key people involved in the election count issue. Most of these very important articles, and much more, can be found on the nation’s oldest site exposing the illegality of computerized elections, www.votefraud.org run by Jim Condit Jr.– All of the articles in the right hand column on the home page of votefraud.org are vital reading for those who wish to restore honest, open, verifiable, constitutional elections. Another important website is www.BlackBoxVoting.org, run by Bev Harris. Votescam: The Stealing of America by the late Collier brothers, Jim & Ken. Black Box Voting by Bev Harris. Incredibly, this team of experts reported that 6 million ballots were DESTROYED as they were processed by the computer systems nationwide — that 6% of the ballots cast in Presidential Election 2000. This could not happen if the ballots were counted properly, before the ballots leave the public sight at the neighborhood polling place, — as still happens at the Iowa Caucus, and in 20% of New Hampshire. “Why am I always being asked to prove these systems aren’t secure? The burden of proof ought to be on the vendor. You ask about the hardware. ‘Secret.’ The software? ‘Secret.’ What’s the cryptography? ‘Can’t tell you because that’ll compromise the secrecy of the machines.’… Federal testing procedures? ‘Secret’! Results of the tests? ‘Secret’! Basically we are required to have blind faith.” — Dr. David L. Dill, Professor, Computer Science, Stanford University, as cited by Ronnie Dugger in his article, “How They Could Steal the Election This Time”, which appeared in the August 16, 2004 edition of The Nation magazine. This Latest video which mentions this website is not on YouTube, but is at UKcolumn.org at the above link. Intrepid Reporter Mark Anderson begins speaking about Electronic Election Fraud and the 2016 Presidential Election at about 19:27. till about 25:28. The ElectionNightGatekeepers.com logo appears around 20:35. This is an excellent interview which we highly recommend. This video explains the entire “Votescam” issue both at the Iowa Caucus and in the states that follow. You only have to watch the first 13 minutes or so, as the last 7 minutes were made so people could act on their own, and a few days before the video maker understood the power and reach of Facebook. “We have spent $7 trillion – trillion with a T – $7 trillion in the Middle East. As you have said very clearly, the United States is bogged down in a costly quagmire in the Middle East, engaged in covert military operations in countries where there is no real U.S. interest. We have gained nothing from 17 years of war in which untold thousands have been killed or maimed and entire nations have been devastated. Our Middle East policy is disastrous and must be changed. If we don’t change our policy we can only expect more of the same – thousands more dead, millions more refugees, trillions more wasted. Why are Americans being sent to wars where there is no U.S. national interest? Whose interest is being served by these military interventions? The American people have been led to believe that the War on Terror is a good thing, while our military operations leave utterly destroyed cities and infrastructure in their wake. U.S. military intervention has contributed to a humanitarian crisis across the region and beyond. The wars have created millions of refugees who have become a burden to other countries. If the War on Terror is a good thing, why has it caused so much suffering and chaos? In order to correct our policy we need to understand who got us into this mess in the first place. The 9/11 terror atrocity and War on Terror plots were both conceived by Israeli military intelligence in the 1970s under the leadership of Menachem Begin, the self-proclaimed “Father of Terrorism” and founder of the Likud party who became prime minister in 1977. The War on Terror doctrine was rolled out in a “propaganda offensive” in July 1979 at a Netanyahu Institute conference in Jerusalem. The Israeli trick was to get the U.S. military to neutralize and fragment its enemies, most notably Iraq and Syria, under the pretext of fighting terrorism. Since 1979, this devious plan has been openly promoted by Benjamin Netanyahu. 9/11 was a false-flag operation designed to kick-start the long-planned War on Terror. On 9/11, War on Terror proponent Netanyahu told the New York Times that the terror atrocity was “very good” for U.S.-Israeli relations. 1954 July – The Lavon Affair: Israeli agents place bombs in U.S. and British libraries and institutions in Egypt in a false-flag operation meant to be blamed on the Muslim Brotherhood. 1967 June – Israeli aircraft and ships attack the defenseless USS Liberty, killing 34 and wounding 171, with the intention of sinking the ship – with no survivors – and the blame being assigned to Egypt. 1983 October – A truck bomb kills 241 Marines in their barracks in Beirut. Former Mossad agent Victor Ostrovsky says Mossad knew the details of the truck, the time, and location of the bombing, but only gave a general warning to the Americans. A nebulous “Islamic Jihad” group is blamed; Defense Secretary Caspar Weinberger says U.S. has no knowledge about who really did the bombing. 1986 February – Mossad plants a radio relay device in an apartment in Tripoli, Libya, to send fake messages that appear to be coming from the Libyan government; U.S. intelligence is successfully tricked and President Reagan orders bombing of Libya based on Mossad’s fake messages. 1978 – Israeli agent Arnon Milchan’s first film features a Boeing 747 crashing into the PanAm building. 1979 July – Netanyahu Institute hosts conference on terrorism calling for U.S. military intervention in Middle East. 1982 February – Israeli Likud strategist Oded Yinon publishes plan (in Hebrew) calling for the “dissolution of Syria and Iraq” and Balkanization of all Arab states. 1983 – Israel creates foe for War on Terror: Under Ehud Barak, Israeli military intelligence (AMAN) begins arming and training Gulbuddin Hekmatyar’s anti-Western Hezb-i-Islami terrorists in Pakistan, including Osama bin Laden. 1987 – Two of Isser Harel’s senior Mossad agents, Avraham Shalom Bendor and Zvi Malkin, obtain security contract for World Trade Center; Port Authority cancels contract when their criminal history is discovered. 1990 – Rejected by Port Authority due to criminal conviction in Israel, Mossad’s Shalom Bendor goes to work for Jules Kroll. 1993 February – Zionists manage prosecution of WTC bombing: Israeli-American Michael Chertoff, U.S. Attorney for New Jersey, plays key role in prosecution. Zionist Judge Michael Mukasey presides over case against “Blind Sheikh.” FBI informant Emad Salem is paid one million dollars for his testimony. Media leads public to believe that Muslims want to destroy the Twin Towers. 1998 December – Philip Zelikow’s Catastrophic Terrorism Study Group publishes report “Imagining Transforming Event” in Foreign Affairs (CFR). Co-authors Ashton Carter and John Deutch work for Global Technology Partners, an exclusive affiliate of Rothschild N.A. 2000 September – A Neo-Con group, Project for the New American Century (PNAC) suggests that “a catastrophic and catalyzing event – like a new Pearl Harbor” may be necessary to facilitate “the process of transformation” they call for in U.S. military policy. 2001 – Israeli Mossad company ICTS controls security screening at U.S. airports on 9/11. Directors include Yair Shamir, son of notorious Israeli terrorist and assassination chief Yitzhak Shamir. 2001 – Israeli intelligence creates false histories for alleged hijackers. Israeli spies posing as “art students” live near hijacker patsies. 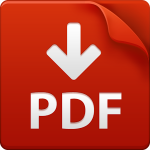 Duplicate documents are used to create false histories, standard procedure for Mossad false-flag operations. 2001 – Ronald Lauder manages Gov. Pataki’s privatization scheme which includes WTC property. Lauder funds Lauder School of Government, Diplomacy and Strategy at Mossad center (IDC) where Israeli Major General Daniel Rothschild heads Institute for Policy and Strategy. 2001 July 24 – Larry Silverstein gets lease for World Trade Center. Silverstein obtains lease thru fellow Zionist agent Lew Eisenberg, chairman of the Port Authority. Silverstein and Eisenberg are both members of UJA board, major Zionist fundraising organization. Since 1996, Silverstein maintains very close contact with Netanyahu; every Sunday afternoon Netanyahu calls Silverstein. 2001 September 11 – Ehud Olmert, Israel’s deputy prime minister, is on an unreported visit in New York City. Why is it kept secret? While all civilian planes are grounded, at 4:11 p.m. on 9/11 an El Al Boeing 747 takes off from JFK bound for Tel Aviv. The flight is authorized by the direct intervention of the U.S. Department of Defense. 9/11 – Alex Brown, a firm with ties to Israeli military intelligence and Yair Shamir’s company Scitex bought many of the suspicious “put” options. “Buzzy” Krongard, executive director of the CIA, headed AB until 1998. His wife works for Rothschild Asset Management. 9/11 – Five Israelis working for Urban Moving Systems are arrested on 9/11 after being seen photographing and celebrating the attack on the WTC. The fake moving company is later found to be a front for the Mossad. Two of the Israelis are known Mossad agents. 9/11 – Israeli military chief Ehud Barak interprets 9/11 on BBC World and Sky News networks in London, blaming Osama bin Laden and calling for U.S. to “launch an operational, concrete, war against terror.” Barak is Netanyahu’s commander in the Sayeret Matkal, a covert commando force of Israeli military intelligence. Other Israeli commandos (e.g. Daniel Lewin) are involved in 9/11. 9/11 – An Israeli son of the Mossad controls 9-11 investigation. Attorney General John Ashcroft puts Israeli dual-national Michael Chertoff in charge of FBI investigation. “For day-to-day decisions, Chertoff has the last word.” Destruction of crucial evidence begins immediately. FBI oversees confiscation of evidence and non-investigation. 9/11 – Two Zionist-owned junkyards manage hasty destruction of evidence. To allow larger ships bound for Asia to load at Hugo Neu the Claremont Channel has been dredged prior to 9/11. Hugo Neu creates a global trading division in 1999, headed by two veteran ferrous metal traders from Marc Rich and Glencore AG in Switzerland. Steel evidence is shipped to Asia although scrap iron price is at the lowest level in 50 years. 2003 March – Zionists control 9/11 myth: Appointed director of 9/11 Commission, Philip Zelikow frames the agenda and decides what evidence the commission sees. A specialist in “public myths,” Zelikow comes to commission with complete outline of report – before staff even begins working. Respectfully submitted by Christopher Bollyn, author of Solving 9-11: The Deception that Changed the World, Solving 9-11: The Original Articles, and The War on Terror: The Plot to Rule the Middle East. Make America Great again, by putting America first and holding the Terrorist state of Israel and their agents in our government accountable for their crimes against the United States and its people as well as for their war crimes against the innocent people around the world. UPDATE: David Anglin​: As far as the FYI, what is your take on the counter-coup, Nicky Nelson? Nicky Nelson: My take is that they will have to let Trump win to reassure the American people that the system is not completely corrupt, so people will feel better about going back to sleep. I think it is obvious that these people have always controlled both sides of every significant war and/or political movement unfortunately.